One of the most iconic locations of the Easter Rising in Galway is the Agricultural College just outside Athenry. Founded in 1905, the original Agricultural station was known locally as the Model Farm and was not an immediate success, as it was in an area which was wracked with agrarian agitation. In 1907 the vast sum of £10,000 was earmarked by the government to establish a training college in Athenry, but ‘owing to the unsettled state of the district’, no progress could be made. In February 1908 it was noted that the station had been attacked and £425 worth of damage had been caused; in the period between January 1907 and November 1909, the RIC recorded ‘five cases of intimidation or injury to property which are believed to be the outcome of a desire of certain lawless persons in Athenry to compel the Department to surrender part of their farm in the neighbourhood.’ Indeed, the trouble surrounding the farm was so acute that the vice-president of the department of agriculture was asked in the Commons if he had ‘any objection, seeing that there is so much agrarian trouble about Athenry, to building this college in one of the law-abiding counties?’ By April 1910, there were two police huts on the property itself containing 19 RIC men, while a further 68 police had been drafted into Athenry from the surrounding countryside. 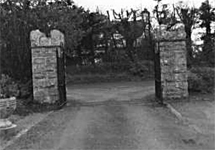 Once rebellion broke out in Galway in April 1916, the Agricultural station was not an obvious target for either attack or occupation, as it was both under police protection itself and also close to Athenry town. However, on Tuesday of Easter Week, while Mellows was retreating towards Athenry from the attack on Clarenbridge RIC barracks, his group met with the Athenry Volunteers, under Larry Lardner, who had decided that the barracks in Athenry town was too strongly defended to take. Upon meeting Mellows, the leaders decided to retire to the Model Farm to plan their next move. The time spent at the Agricultural station paradoxically demonstrates both the strength and weaknesses of the rebellion in Galway. In total, around 500 Volunteers and Cumann na mBan congregated there. These well outnumbered the police in the local area, and illustrated the numbers that could have turned out if communications had been better and MacNeill’s countermanding order had not caused such confusion. However, they were very poorly armed: it was estimated that they had only 35 rifles and 350 shotguns. It also shows the vacuum of planning and effective leadership. The decision to occupy the Farm was an ad-hoc one, made simply because it was close by where the two groups of Volunteers met and, although it offered shelter, it was almost impossible to defend. While there the leaders constantly discussed how to proceed and they were hamstrung by the lack of a coherent overall plan for the county. On Wednesday morning a small group of RIC men emerged from the police huts and there was a brief exchange of fire with the rebels. An eye witness suggested that four RIC men approached the farm and were engaged by 10-12 Volunteers, with the few rifles the rebels possessed. As a result of this, on Wednesday afternoon the decision was made to leave Athenry and move towards Moyode which, it was hoped, would prove to be a more defensible position. HC Debates 29 July 1909, vol. 8. col. 1452W. HC Debates 17 February 1908, vol.184, col. 447. HC Debates 1 December 1909, vol. 13, col. 529W. HC Debates 4 August 1909, vol. 8 col. 1843. HC Debates 28 April 1910, vol. 17. col. 746W. BMH WS 298, Ailbhe Ó Monachain. MSPC A/21(4)A/16, ‘Easter Week in 1916 – Service in County Galway’.